As a youngster, I was fascinated with the idea of becoming an archaeologist. I could not imagine a more romantic profession than studying ancient cultures and searching for clues in ancient sites. To practice, I would routinely bury my coin collection in plastic bags, make maps, and then months later get my metal detector out and go dig them up. Indiana Jones I was not, but I never lost my appreciation and sense of wonder about the people and animals that inhabited the Earth before me. Last Spring, my wife and I were expecting the arrival of our first child, Graham. As a new parent, my mind was continually preoccupied with what kind of parent I would be, what type of personality and interests Graham would have, and how that would influence his life into adolescence and eventually adulthood. Just a few weeks after Graham was born, I was taking a mid-day stroll in my freshly tilled garden. I jokingly refer to my garden as a prehistoric parking lot, given the never-ending supply of jagged granite stones. This particular day in the garden was after a rain, which is prime rock harvesting time. My stroll, however, yielded more than the typical handfuls of brown granite. Typically, I only bend down for bigger rocks that my hoe or tiller finds, but at the end of one row, a small rock caught my eye through the rain soaked soil. I reached for the burgundy hued rock and was surprised to find an “arrowhead” about the size of a fifty-cent piece. In the hours after my find, I wondered about this ancient tool and the person that crafted it. What kind of life did the person have? Was my garden the site of his hunting grounds or perhaps where they brought game back for eating? Did this “arrowhead” yield successful nourishment for him and his family? 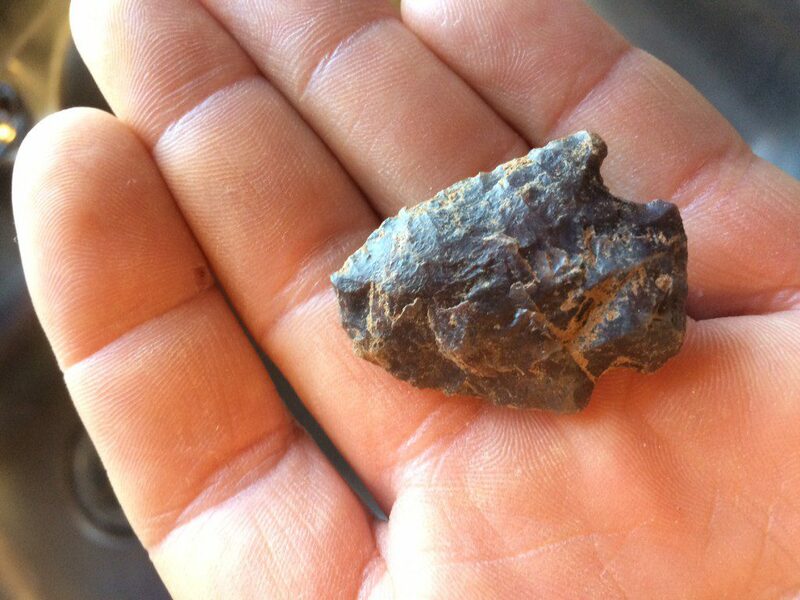 The corner notched spearpoint was used some 5,000 – 7,000 years ago. After finding the “arrowhead,” I was reminded of an oddly shaped stone that I found some months prior when planting muscadines. This particular stone was almost perfectly round and about eight inches in diameter and no more than two inches thick at its widest point in the center. When I initially dug it up, I thought it was different and put it to the side but never made a connection that it may have had some history and purpose to it. After finding the “arrowhead” though, I suspected that this too might have been some tool used by people that lived on my two acres long before me. When I first unearthed this disc I first thought it may have been some sort of melted type piece from the previous landowners burn pile. Not knowing much about Native American relics, I sent some pictures off to Dr. Ervan Garrison at University of Georgia’s Anthropology Department. Dr. Garrison reported that my “arrowhead” was much older than bow and arrow technology and was in fact made a few thousand years before the technology. He explained that it was likely used with a spear-thrower or atlatl. He described the point as a corner-notch spear point from the Middle Archaic Period (5000-3000 BC). The round stone was not as easy to identify. 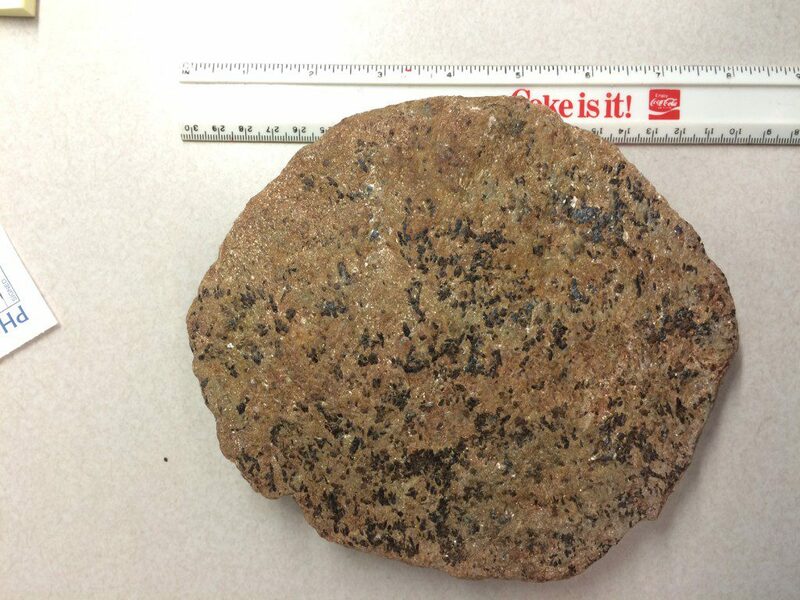 Dr. Garrison did say that it appears to be a grinding or polishing stone. 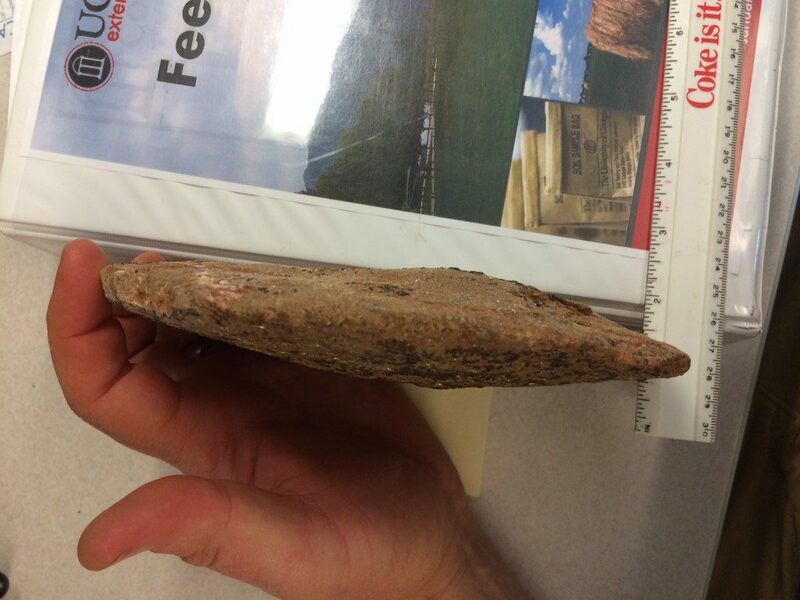 A stone like this was likely used by a female doing food preparation or other daily tasks, he said. Side view of my stone discus or ancient polishing/grinding stone. I was astounded and humbled to have found these pieces of ancient history while performing the trivial task of picking up rocks in my garden. Finding these treasures has given me a greater connection to my garden and early history of North Georgia. When Graham gets older, I plan to hide the point in the garden so he can experience the thrill of discovering such a piece of history. I hope it will inspire him to value human history and the natural world and selfishly maybe make him excited to pick up rocks in Dad’s garden. Posted in Archaelogy, Cherokee County, Rocks, Soil. This entry was tagged archaelogy, arrowheads, Georgia archaelogy, Georgia history, Native American tools, spring gardens. Bookmark the permalink.